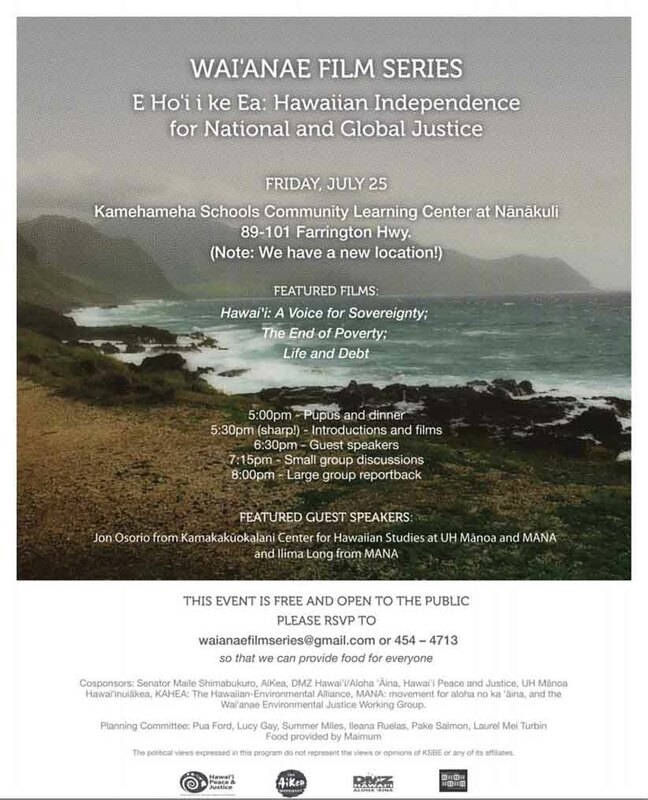 HONOLULU - July 17, 2014 - PRLog -- The WAI'ANAE FILM SERIES E Ho'i i ke Ea: Hawaiian Independence for National and Global Justice will present segments from the films "Hawaii A Voice For Sovereignty", "The End of Poverty", and "Life and Debt" on July 25, 2014. The event is a community outreach for the purpose of discussions regarding national and global justice. It will be held at the Kamehameha Schools Community Learning Center, 89-101 Fairington Hwy., Oahu, HI. The event will begin at 5:00 P.M.
Jon Osorio, from Kamakakūokalani Center for Hawaiian Studies at UH Mānoa and MANA and Ilima Long from MANA are featured speakers at the event. a source of information through the voice of the people for libraries and universities throughout the U.S., New Zealand, and Canada.